As the importance of having a strong online presence continues to grow, more people are opting to build their own websites using do-it-yourself (DIY) tools. These tools, also called website builders, are relatively easy to use and inexpensive. Examples include Wix, Squarespace, Weebly, and more. There are numerous website builder providers to choose from, but the majority of content you find online about these tools are “Top Ten” rankings. Who is the typical user of DIY website builders? What kinds of websites are they building? Can DIY web builders be used to build complex websites? 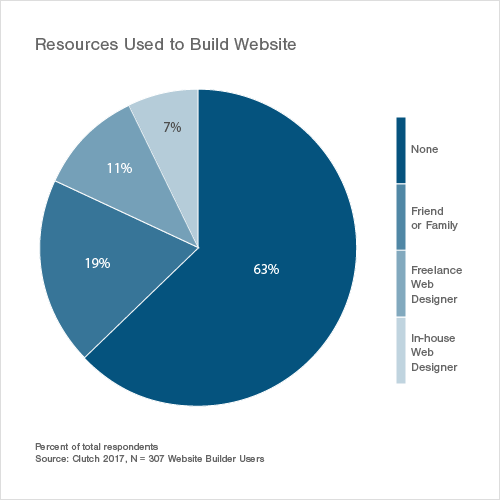 Are web builder tools a viable resource for small businesses? To better understand the website builder market, we surveyed 307 individuals who created a website using a DIY website builder. All respondents indicated that they were ‘very involved’ in the process of building their website, and 63% said they built the site without help from others. 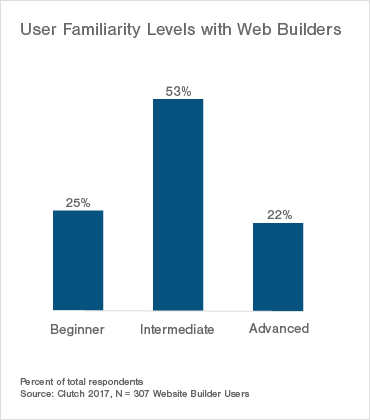 53% of survey respondents say they have an intermediate level familiarity with website builders. 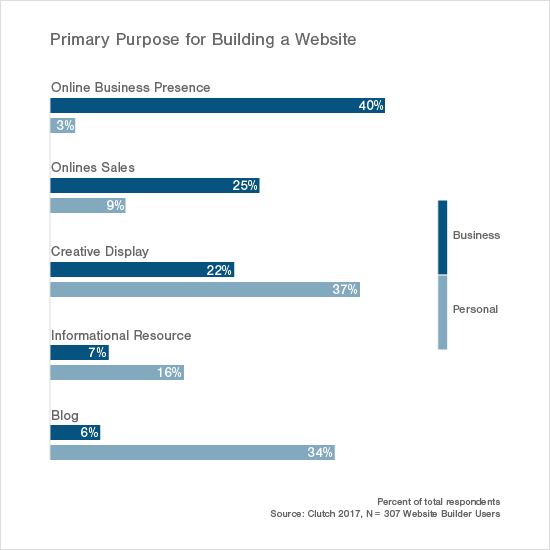 Nearly half (48%) say their website was built for personal purposes, while 42% say their website is for business. Websites built for business purposes are typically more complex. Web builder users tend to create two different types of websites, either personal sites – a creative display, blog, or portfolio – or business sites – for online sales, e-commerce, or an online business presence. Understanding what users of web builders create with the DIY tools is an important step in identifying what makes these tools stand out. While the majority of users are familiar with the techniques necessary to build a site, the actual types of websites being built vary. Nearly half of respondents (48%) indicated that their website was built for personal purposes, while 42% said that their website is for business. The fact that there are two very separate types of websites being built demonstrates that the users of DIY web builders are implementing the tools in different ways. One of the main benefits of DIY website builders is their ease of use. DIY tools make the process of building a website relatively straightforward for individuals who don’t have a technical background or coding expertise. To get a better sense of the typical individual who creates a website using DIY tools, we asked survey respondents to select their ‘level of familiarity’ with website builders. Beginner: I have changed content, fonts, and images, etc. Intermediate: I have set up a site, including advanced features, without assistance. Advanced: I inject or customize HTML/CSS or am well versed in search engine optimization (SEO), e-commerce optimization, or other more technical features. 53% of respondents said they were intermediate, while 25% said they were beginners and 22% said advanced. We also asked survey respondents about the amount of assistance they received when building their website, either from a friend, family member, or external web designer. 63% said they built their website entirely on their own. They are experienced with technology. They are able to set up a standard website, including some advanced features and integrations. They are highly involved with building the website on their own, instead of delegating the responsibility to somebody else. While the typical web builder user has an intermediate-level technical background, the websites they build differ in level of complexity. Yes, individuals in need of a website can use DIY web builders to create clean, responsive websites that “get the job done,” so to speak. But how far can they go, really? Can DIY tools be used to build more complex and advanced websites? Determining the level of complexity of a website ultimately comes down to the amount of features that are included, as well as the number of tools that are integrated by the user. During the website building process, users are presented with a large amount of setup options in the form of features and integrations. Users are able to select which features and integrations to include based on their needs. 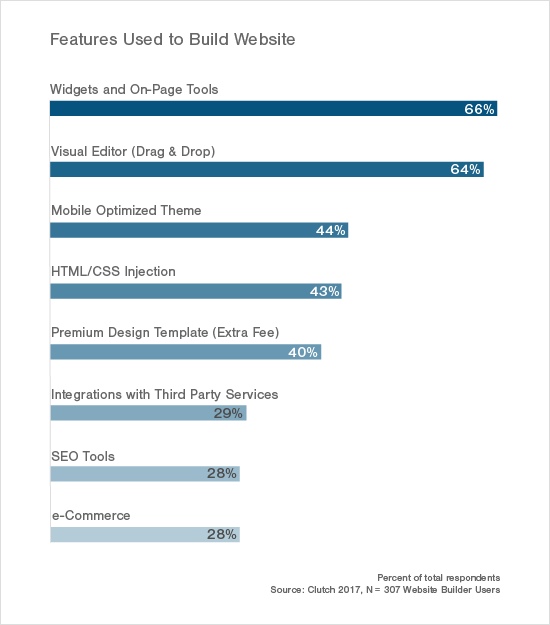 On average, web builder users use more than one feature to build their website. The most commonly used features are: widgets and on-page tools (66%), drag and drop visual editors (64%), and mobile optimized themes (44%). In order for a website to be complex, it must include five or more integrated tools. Users who take the time to integrate five or more tools demonstrate an intent to use the site in a complex manner: by generating interactions and conversions. 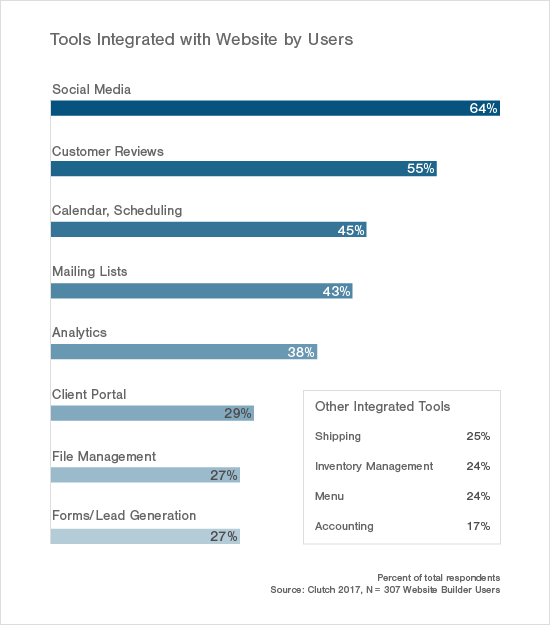 The most popular integrations web builder users incorporate include social media (64%), customer reviews (55%), and calendar/scheduling tools (45%). Websites built for businesses are more complex than those built for personal purposes. 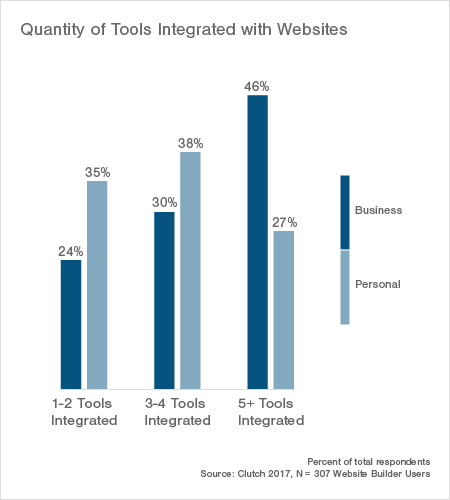 We applied our five-integration hypothesis and found that 46% of users with a business website integrate five or more tools. Comparatively, only 27% of users with a personal site integrate five or more tools. Business users are more likely to use their site to engage with potential customers and generate business leads. Of the respondents who built their website for business, 40% said their site’s primary purpose was to improve their online business presence, compared to only 3% of respondents with a personal website. They also focus more on generating interactions and conversions. The second most popular use of a business website is online sales (25%), while only 9% of respondents with a personal website say the same. Are DIY web builders a sufficient resource for business users who want to create a truly comprehensive and advanced site? Businesses are constantly working to develop their marketing strategies, a large part of which involves having a strong online presence. In particular, e-commerce is a huge element for many businesses. It’s a big source of revenue, as long as the business can convert site visitors into customers. Web builder software makes it easier to launch an e-commerce business, according to Kim Chappell, Head of Communications at Weebly. Additionally, web builder software has adapted to business needs. As needs became more complex, the tools also began to offer more advanced features. However, although there are benefits to using DIY web builders, they are not always a viable resource for businesses. — Justin Handley, President, Web Mission Control Inc.
For some businesses looking to grow online, it may make more sense to consider solutions beyond DIY website builders. While DIY website builders provide the tools to produce clean and high-quality websites, a more complex website may require an alternative solution. For some businesses, it may be beneficial to move beyond DIY website builders and either transfer their website to a content management system (CMS) or hire a web designer. With a content management system like WordPress, individuals can still build their website on their own but are given support from a professional throughout the process and after the website's launch. Additionally, there is more customization with a CMS that allows for the construction of a more complex site. Especially for websites focused on e-commerce, the implementation of advanced features may require assistance from a design expert. To optimize the online presence for an e-commerce site, hiring a web design company can provide significantly higher amounts of flexibility and customization. Although the cost will be higher, the ability to build a complex site with many features and integrations will be more realistic. With professional guidance, small businesses can feel confident in their opportunity for online growth and can feel secure that they will be supported along the way. In the end, DIY website builders allow users to create a functional website to a certain extent, but if the intent is to build a truly advanced and complex site, then an individual should upgrade their strategy by hiring a designer or moving to a CMS platform. For small businesses with the goal of serious online growth, DIY tools should most likely be surpassed as a viable option from the get-go. 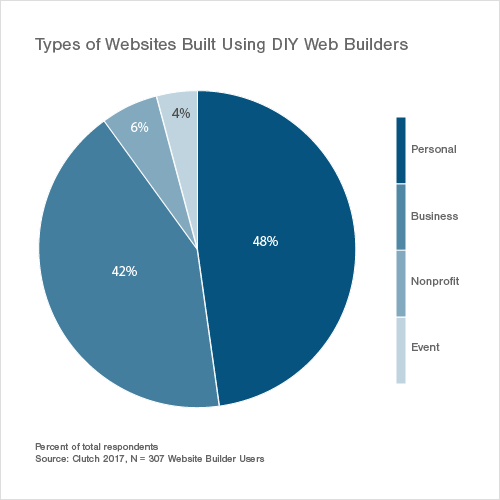 Clutch’s survey included 307 respondents who are full-time small business employees and users of DIY website builders. 30% of respondent companies have an annual revenue of less than $1 million. Data was collected throughout December 2016. Have any questions or feedback about this survey? Contact Jenna Seter at [email protected]. Explore the app features and development processes that increase (or decrease) the cost of an app. Looking for DIY web builder software? Read detailed client reviews of website builders and compare them to other DIY tools to find the right solution for your business.